It has felt really good the past few months to get into a groove of regular sewing and finishing projects. A Lovely Year of Finishes and Finish Along 2014 help me stay focused and motivated. This month for ALYoF I'd like to I'm going to finish the Dinosaur Philanthropy Quilt that I started quilting... um... in 2012. (Not too bad since September's ALYoF was a UFO from 2003.) The quilt was pieced by another member of my guild and I'm quilting it with a sample of Leah Day's FMQ patterns since I was just starting to free motion quilt when I started working on it. It's been on the back burner for a long while, but I only need to quilt 12 more squares and bind it. :-) Pathetic that I haven't finished that up yet, huh? 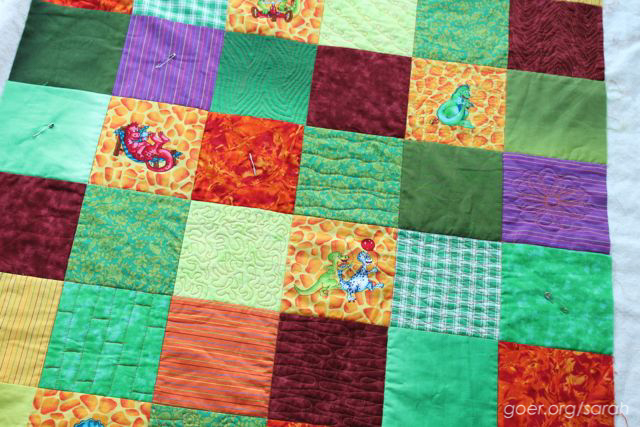 Get caught up on Leah Day's Building Blocks Quilt Along. Finish ironing my pre-washed fabric. My newest project is a vehicle baby quilt, using fabrics pulled from stash. 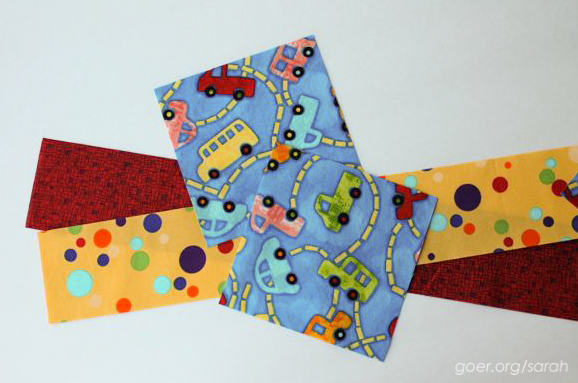 I'll be making yellow and red 4-patch blocks to go with the feature fabric blocks. What are you working on this month? What's your most neglected UFO? 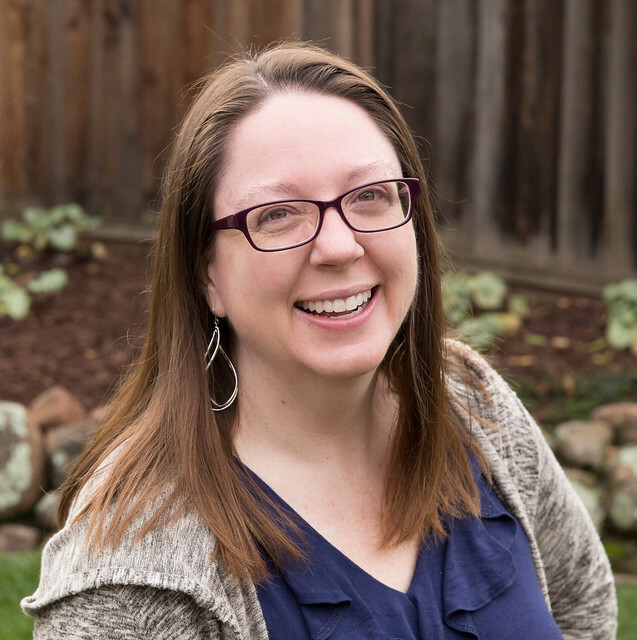 I'm linking up on the October ALYoF Goal Setting Party and the Q4 Finish Along Goal Setting Party. Posted in Quilting. Tags: goals on October 5, 2014 by sarah. My most neglected UFOs are my scrapbook/photo albums! Other less guilt inducing UFOs include knitted socks (1 pr on needles), a set of knitted bags to felt and line (I'm torn to start because they look so pretty just knit!) , a knitted but unstuffed Mother Bear donaton (just don't want to buy a whole bag of filler to make one small bear), and the one that looks to be finished soon is a cut out stack of 'hen' pot lid holders. I took the pattern for these from a worn one that I LOVE. I will post a photo on my FB page, they are so cute! So my vicarious pleasure in your completions has taken life under scissors and needle! Your projects all sound great. I look forward to pictures on FB. I knit one sock once. It didn't fit me. Have you considered stuffing your bear with scrap fabric. I can save my scraps of fabric and quilt batting for you. I just donated a bag, but I'll make more. I'm touched that I've inspired you. Thanks for being a faithful blog reader. These are looking great - you're going to get them done! If only I didn't have more ideas than I have time! Thanks for stopping by, Angie. 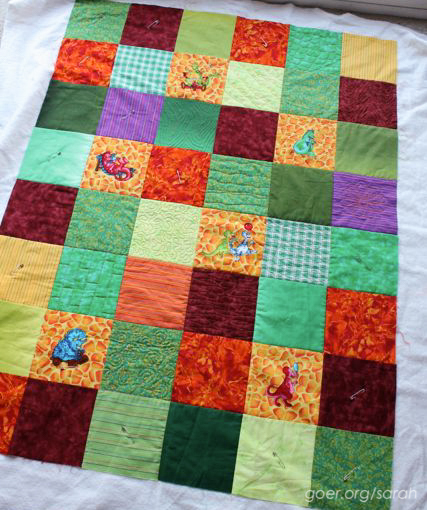 Love all the varied quilting in your dino quilt- bravo on working through such old WIPs! That's awesome! Thanks! It feels good to get some old stuff off the to do list... a great effect of regular sewing. Wow! 8 out of 18 is great! I don't like having lots of quilting UFOs, so my most neglected UFO is my scrapbooks. But at least the photos are all organized. Wow - that is a list! But congrats on getting so much finished on the last list!! You will rock it!